Recently featured on Entertainment Tonight, Dr. Raffi Hovsepian discusses his new liposuction procedure which is changing the game of plastic surgery: Shrink Wrap Liposuction™. This new and innovative liposuction procedure is simultaneously less invasive and more effective. It uses FDA approved lasers to melt fat, which makes the fat easier to remove from the body and requires only a tiny incision in place of the traditional hip-to-hip laceration used in tummy tucks. When patients undergo Shrink Wrap Liposuction™, they are usually able to return to regular activity in as little as 24 hours. This procedure not only gently removes as much as five liters of unwanted fat, but also tightens the skin around the targeted area. A laser stimulates the collagen in the skin so it will contract and contour around the body for months after the procedure, eliminating the problem of loose extra skin after drastic weight loss. With such a quick procedure and such a short recovery time, celebrities can get periodic touch-ups to ensure their body is always in top condition without sacrificing any work time for recovery. “This procedure allows us to sculpt and shape the body by removing or redirecting body fat quickly and gently. Patients can come in for a consultation with a photo of Jennifer Lopez or Megan Fox and achieve the exact look they want with virtually no recovery time,” said Dr. Hovsepian. This philosophy and attention to detail is apparent from Dr. Hovsepian’s patients’ before-and-after pictures posted on his social media. His polished method is a key factor in his successful track record as an aesthetic plastic surgeon in one of the most competitive areas for plastic surgery in the world. 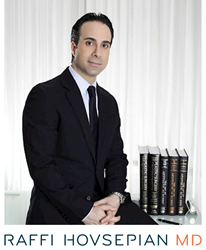 Dr. Raffi Hovsepian is a triple board certified plastic and aesthetic surgeon. He has pioneered the innovative liposuction procedure Shrink-Wrap Liposuction™. Dr. Hovsepian has received numerous awards for his achievements, including indoctrination into the American Board of Medical Specialties, Top Doctor 2016 by Castle Connolly Medical Ltd and Honors of Distinction and Excellence by the Consumers’ Research Guide of America. He has appeared on multiple television programs and in popular magazines such as The Dr. Oz Show, Entertainment Tonight, Primer Impacto, The Globe, In Touch Weekly and Life & Style Magazine.